You might associate the Costa Brava with high rise hotels and apartment blocks in large resorts but holiday camping site Mas Patoxas is far removed from these. Still close to the beaches and other attractions, this luxury camping site is located in the delightful countryside near Pals and is ideal for a family holiday. Offering camping luxury or the spaciousness of a mobile home, Mas Patoxas has plenty of outdoor activities to keep the whole family entertained. There are two tennis courts, a basketball court, and a football field. Keep fit fans will enjoy the indoor gym and there's an indoor games room with billiards, table tennis, games, and a ball pit. This camp also has a working farm and guests are encouraged to interact with the animals. Self-catering provisions can be bought at the camp supermarket. 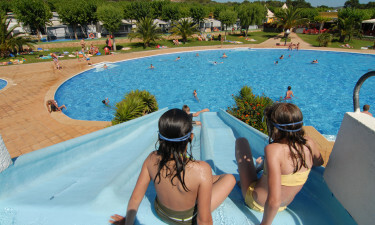 A big feature of a camping holiday in Spain is swimming. Mas Patoxas guests can enjoy a large adult pool with slide. It's surrounded by a large terraced solarium and lawn set with palm trees for sunbathing and from where adults can watch the kids enjoying their own smaller pool. If beach swimming is preferred, the beaches at Pals and Begur are less than 5kms from the campsite. There is lovely tranquil countryside around the camp for walking, cycling, and other sporty pursuits, and it's delightful to visit the medieval villages to experience their customs, markets and festivals. 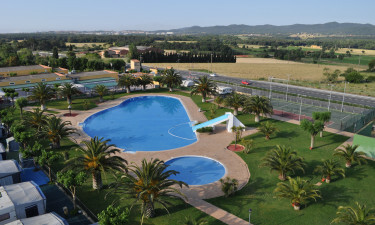 Book with Luxcamp and you can enjoy a lovely rural but luxury camping holiday while still being close enough to the bright lights of the Costa Brava when you want to amp things up.